Indian artisans give new life to vibrant saris with these one-of-a-kind earrings. Before they were earrings, these vibrant ribbons had another life. They were a small section of a bright sari worn in the bustling streets of South Asia. Imagine their fabric in a sea of color: moving through markets filled with exotic foods and goods. 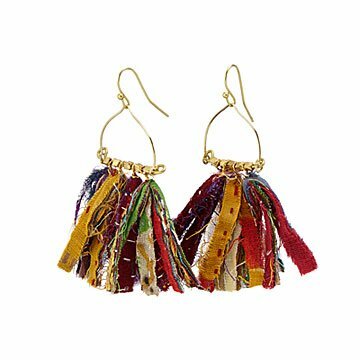 Artisans in India craft each colorful design, cutting strips from the reclaimed cloth and fastening them to bell-shaped brass wires. Give the one-of-a-kind pair to a worldly loved one, or friend with an individual, unique style. Handmade in India. Love that these are recycled, multi-colored so can be worn with a lot of things.